Welcome to the Southern Regional Center for Children and Youth with Special Health Care Needs! What is a Care Map? How does a Care Map make your life easier? Start a Care Map for your child! April 9th in Fennimore–the workshop and light supper are FREE! Register at: https://go.wisc.edu/9o06dx or call Sonja at 608-265-8955. If you are interested in childcare for young children, please contact Rose Cutting before April 5th at 608-330-0354. You must pre-register for childcare. 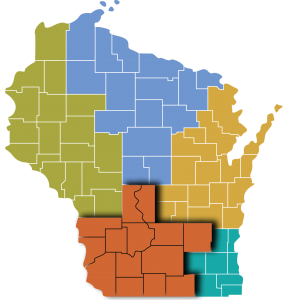 Our Southern Regional C enter serves the following counties: Adams, Columbia, Crawford, Dane, Dodge, Grant, Green, Iowa, Juneau, Lafayette, Richland, Rock, Sauk and Vernon, shown in orange on the map. Contact the Southern Regional Center. Wisconsin Well Badger Resource Center is a statewide public health Information and Referral (I&R) service and resource program offering a toll free phone line and website for Children and Youth with Special Health Care Needs and more. Well Badger is staffed to provide information and referrals with a deliberate focus to engage high-risk populations and for those with special needs.